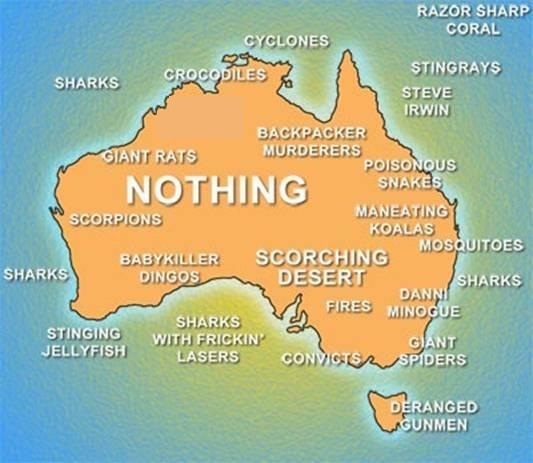 The World's (Funny As Hell) Perceptions About Australia! Of course I got lots of crazy questions about America when I was down there as well. The media, gotta love how it creates horrendous generalizations about countries (hence why I bug everyone so much to get out and travel!). That was brilliant. I could have read a thousand more of your wonderful replies. Someday, I’d like to visit your fine country, but I’ll need to get in better shape before I’m self-confident enough to go to the hippo races. We do have marsupials in the street in Cairns. The wallabies are everywhere in the Northern Beaches area. My boys have to dodge the droppings on their soccer field, because it’s right next to where the wallabies like to hang out. I’ve also been asked the question about Christmas from someone in Scotland, but she asked me “What time of the year is Christmas?” and I answered 25 December and she did a face-palm. Greetings from a new Twitter follower. I’m from Vancouver originally. Not so far from Seattle, so we’ve done a kind swap!